Organization bylaws are a set of rules and procedures used to determine how an organization will run. They are a vital tool, defining the relationships, duties, and responsibilities of the people who are elected to manage the organization. From time to time, the Board of Directors reviews the bylaws to identify outdated language and practices to insure that the bylaws are in accord with the law and to make for the best possible governing document. The current LAABP Executive Board has worked diligently with a non-profit attorney, Nancy McCullough, to draft bylaws that will promote and protect the interests of the organization. Now is the time for membership review and input. 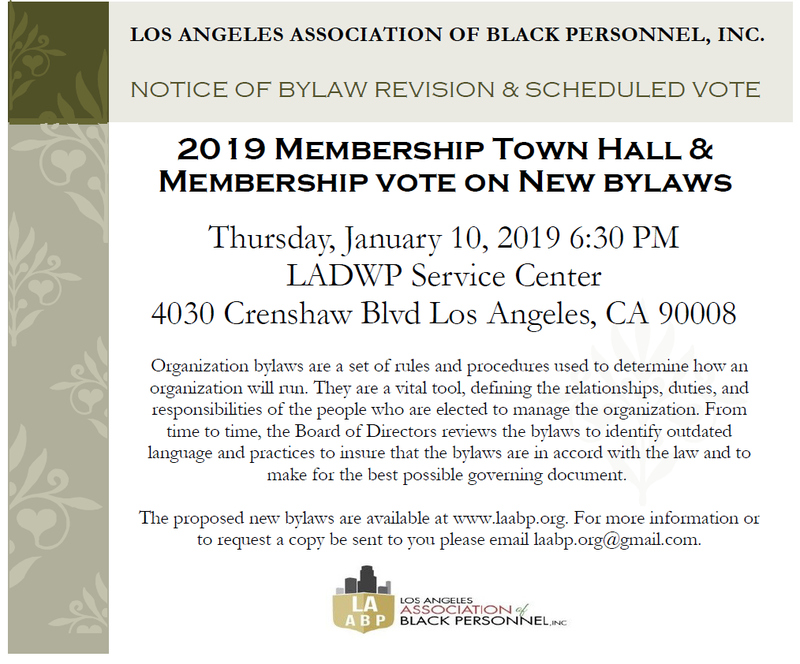 Please take this opportunity to review the proposed LAABP bylaws (in their entirety). If you have any questions, concerns, or suggestions, please use the form below to submit your correspondence. Click here for the proposed Bylaw revision to be presented to the membership on January 10, 2019. Once the review period has ended, the LAABP Executive Board will provide responses to the most commonly asked questions, as well as provide a voting date/procedures to approve the bylaws. Click on the links below to review documents.